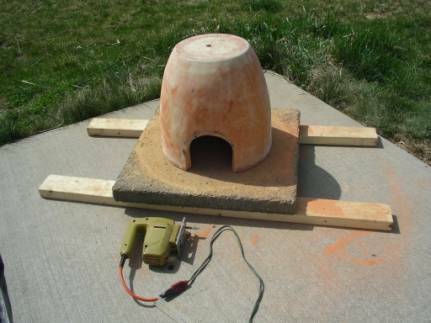 This project allows students to create a working bread oven for the cost of large clay flower pot and a paving stone (typically $30-40 at your home or garden center) and a bag of barbecue briquettes. 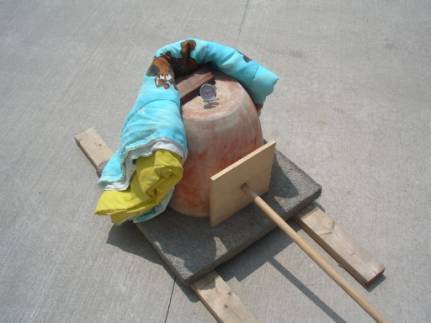 Although this does involve fire, there is no open flame and there is very little danger of igniting any other materials and the project creates no hazardous waste. 1. 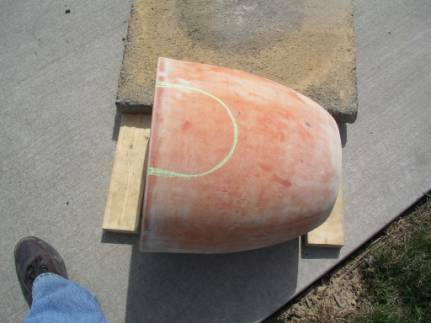 Mark the placement of the oven door opening on the terra cotta pot with chalk. The opening should be at least six inches wide at the lip of the pot and at least six inches tall to allow for the height and width of the hoe and a loaf of bread. 2. 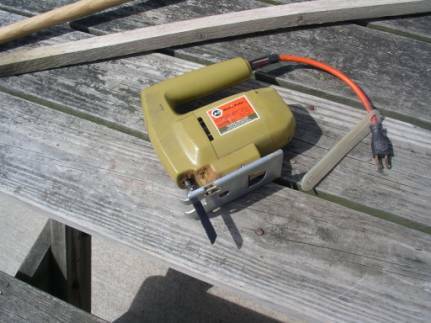 Cut out the opening using the saber saw. Go slowly as to not crack the pot. 3. Place the two halves of the 2” X 4” about 2 feet apart and place the paving block on top of them. 4. 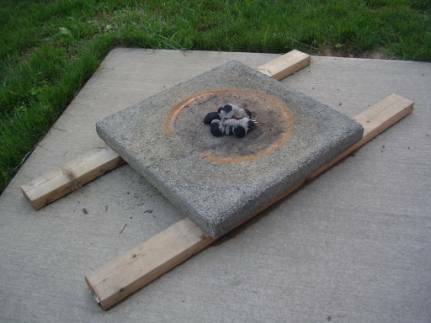 Place the oven top down on the paving block. YOU’VE MADE YOUR OVEN! 1. 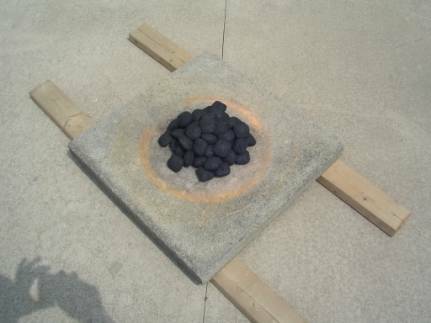 Remove the oven from the “hearth stone” (the paving block) and place about 50 charcoal briquets in the center of the block. 2. Allow the fire to burn until no flames are present and the briquets begin to turn gray (about 15 minutes). 3. Insert the oven thermometer through the hole in the top of the oven (what was the bottom of the pot). Preheat the oven to at least 375°F, preferably to 400°F. THIS IS THE TRICKIEST PART. The oven temperature will depend on the outside air temperature, the wind, the amount of charcoal, and the draft moving through the oven. The draft is controlled by placing the 8” X 8” tile over the opening as a door and by closing down the hole in the top using the small piece of wood. Too much draft and all you heat escapes out of the top. Too little draft and the fire goes out. To get the most heat out of your fire, watch the temperature and adjust the draft. If the oven is closed up and the temperature is dropping, you have too little draft. Try opening the hole in the top, if it continues to drop try opening the door. If the temperature begins to rise, you had too little draft. If it is a cool or windy day you may need to insulate the oven (try using an old blanket or coat). 4. To get the draft just right you may need to add spacers below the door. This allows just enough air to be drawn into the oven at the level of the coals where it is needed. 5. Open the oven and using the hoe, move the coals to the outer edges of the oven, leaving enough room in the middle for your bread (about 6” X 6”). 6. 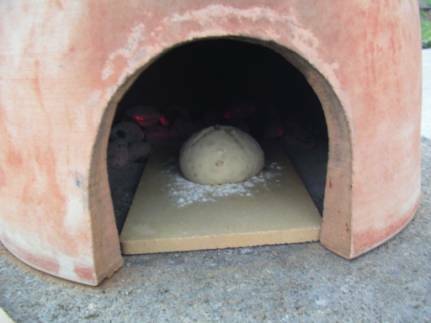 Place a formed loaf of bread (see below) about the size of a baseball on a lightly floured small ceramic tile and insert the tile into the oven. 7. Replace the door and hold it in place with the hoe. 8. Bake your bread for 30-45 minutes. You may want to turn it around one half turn about 20 minutes through the baking. The exact time of baking will depend on the heat of you oven and the size of your loaf of bread. 9. 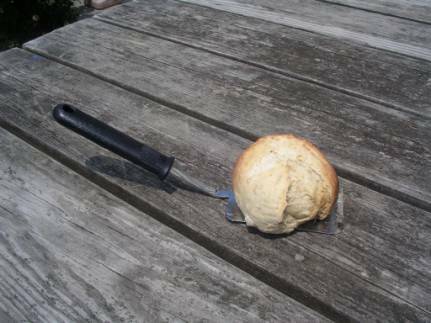 Carefully remove your bread from the oven using a metal spatula (peel). 10. Allow the bread to cool for 5-10 minutes and then EAT! What three things could you do if your oven didn’t get hot enough? What three things could you do if your oven were too hot? Why doesn’t the oven get hot immediately? Why were the walls of clay ovens so thick? Why were mills and ovens highly regulated in Medieval Europe? What was different about Colonial America that made this regulation difficult? 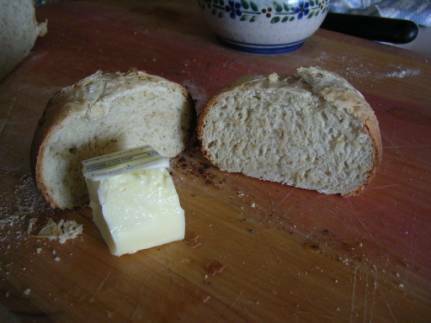 Considering how long it took to make your bread from start to finish what portion of a colonial homemaker’s time was likely involved in bread baking? What grains would have been available to the Colonists and how did this differ from Medieval Europe? How would the grains affect the type of bread eaten? Most of the items you will need are available at your local home supply center. It is best to site the oven where the air is still (try to avoid windy places). Each of the three loaves of this bread is about the size of an orange. In a large mixing bowl, measure the rolled oats and 1 cup all purpose flour and stir in yeast, sugar, salt butter and water. Beat in an electric mixer at medium speed for 2 minutes, or for an equal length of time with a wooden spoon. Stop the mixer. Stir in balance of the flour, a half cup at a time, first with the spoon and then by hand. The dough will be a rough shaggy mass that will clean the side of the bowl. Turn the dough onto a lightly floured work surface – countertop or bread board – and knead with a rhythmic 1-2-3 motion of push-turn-fold. The dough will become smooth and elastic. Sprinkle more flour on the dough and the work surface if the dough continues slack and sticky. Break the kneading rhythm occasionally by throwing the dough down hard against the countertop. Knead for 8 minutes. Place the dough in the bowl and pat with buttered fingers to keep the surface from crusting. 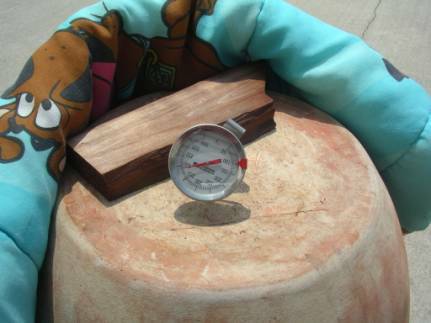 Cover the bowl tightly with plastic wrap and move to a warm place (80-85°F) until the dough has doubled in size. You can test if it has risen by poking a finger in it; the dent will remain. Turn back the plastic wrap and punch down the dough. Knead for 30 seconds to press out the large bubbles. Divide the dough into three equal pieces and let rest for 5 minutes. Beat the egg white and one tablespoon of water together in a cup until frothy (if seeding bread). Sprinkle the seeds onto a plate or into a bowl. Shape each part of the dough into a round ball, slightly flattened on top. Hold loaf in the fingers, brush top and sides with the egg white mixture. Invert the loaf in the seeds, pressing down lightly to cover. Carefully place the loaf on the floured tile. With a sharp knife, cut a cross in the top with two grooves about ½ inch deep. Place the baking sheet in a warm place and cover carefully with a length of wax paper. The loaves will double in size. Preheat the oven to 400°F. Bake the loaves in the oven until they are golden brown. To test if they are done, turn the loaf over and tap the bottom crust with the forefinger. 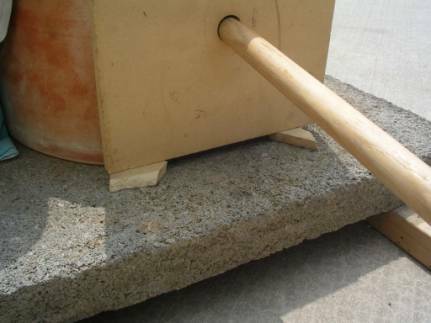 A hard hollow sounds means the bread is baked through. Don’t over bake these small loaves. Midway in the bake period shift the loaves so they are exposed equally to the temperature variations in the oven. Remove bread from the oven and allow to cool on a metal rack.